We all know what happens to the best laid plans, right? Well with the announcement of her 3rd pregnancy and the accompanying Hyperemesis Gravidarum…a spanner really got tossed in the works for George’s first day at Thomas’s Battersea in London. 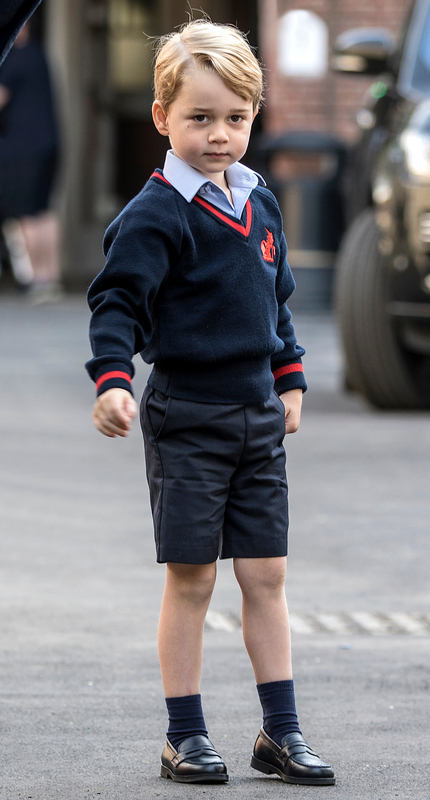 Prince William had to take George on his own. It went well from what we were allowed to see and from what William said at an engagement later at Kensington Palace. George Cambridge, as he will be known at school, was met by the Head of the Lower School. They all shook hands and then headed inside. George seemed a bit nervous but that makes sense on such a big day. We are sure that Catherine is gutted to have missed out on George’s big day. Maybe he can snuggle with her later and tell her all about it. Here is one more look at the young George Cambridge as headed off on a new adventure. He looks very cute in his school uniform. Lord Freddy Windsor’s daughter,Maud started school here as well.